The addition, first spotted by local Chicago publication DNAinfo, was in place for about an hour. The logo wasn't in any previous renderings of the location, and it remains unclear whether it will be reinstalled. "Our store on North Michigan Avenue has welcomed more than 23 million customers since it opened in 2003," said Apple spokesman Nick Leahy in 2015. "We're now creating something even more remarkable for Chicago." 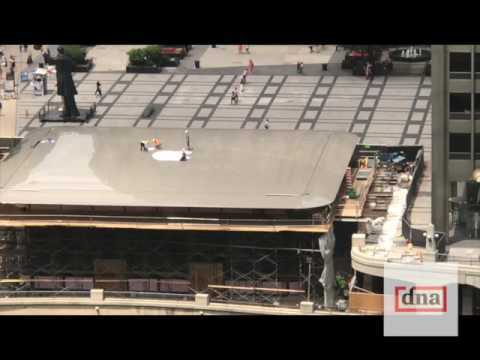 When ready, Apple will shift its 679 N. Michigan Ave. store to the new location. Development analysts say the move will refresh flagging foot traffic and boost retail sales in the area surrounding the store. The new store takes the place of an abandoned food court, and anchors one end of the North Michigan Avenue shopping district. Plans and architectural renderings filed by the Zeller Realty Group, in 2015 detail a 20,000-square-foot glass, steel and wood building. The initial build cost was pegged at $62 million, about triple the cost of the Union Square, San Francisco location. However, documents filed just a few weeks later trimmed the cost down to $26.9 million, more in line with other Apple stand-alone locations. That makes me smile. You have to wonder who had this idea. Nice gag. BTW why is the roof so shiny? Is it wet? Is it glass? You mean by the dozens of skyscrapers surrounding it? Yeah, they'll never see it. I have already seen photos posted by a friend who overlooks the store, showing a succession of gigantic cranes downloading ???. Now we know. It's the gigantic CPU, memory chips, and SSD drive for the gigantic Macbook Air store. I like it..Apple has a flair for things like this. I often use to look out the windows of where I worked which was located on the upper floors of the McGraw Hill building in NYC. You can easily see the tops of lower buildings, so I don't know why someone is saying this is a waste of money to put an Apple logo on the roof. Couldn't it be some subliminal type of advertising (for the higher-ups)? Sure, it won't be visible to everyone but there's still a fairly high number of people who could see it over the years. It's more interesting than looking down on a roof with just a common AC unit on it. That's awesome. I hope it's visible for people flying in and out of the Windy City. Au contraire. I hope they update the roof with seasonal "stickers" throughout the year. This will generate some nice buzz at a very affordable price. Certainly cheaper than the glass cubes and pyramids or whatever at other Apple stores (which are also cost-effective brand building efforts). Presumably The location doesn't get enough sun to justify a solar array, so why not make the roof appealing? Apple's manufacturing plant in Fremont, CA used to a giant rainbow Apple logo on the roof - only visible from an airplane flying over. I always wondered why so many buildings put up so much effort on all sides and neglect the roof. 1) Especially when there are so many critical components up there. Take the AC units. Most buildings have no protection for them. They just get beat up by sun, rain, bird crap, bugs, leaves, debris etc. - when all those items need is s "roof over their heads for an extremely long life with much less maintenance. 3) the biggest, bestest company in the world showing a crazy attention to detail is a good thing in my book. Crazy good. Insanely great? The roof is just one story tall at the plaza level and the store goes down for a second level with big windows over looking the river. This could easily be seen even as people walk or drive over the Michigan Ave bridge which would be higher than the roof. This building is going to be %*&#[email protected]& incredible. It should easily be Apple's best fully-original store to date. * The perfect balance of function, minimalism, and warmth (wood paneled ceiling), with a perfect adaptation to its location (with multiple terraces looking onto the river, an aesthetically pleasing roof observable from nearby buildings), and perfect juxtaposition between outside and inside (which also happens to be a pioneering, at the time, feature of Jobs' childhood home). And the location couldn't be better. It's 1) near the shopping district, 2) near an intersection (so won't be overshadowed by any other buildings in the future), and 3) it is located right across the river from where many of the most popular boat architecture tours are based. Right across. I took one of those boat tours fairly recently, they gave a decent talk about the Apple Store before we even took off. *Although, the Milan location is certainly going to make it a close call whenever it opens. Waste of effort and materials for a feature only to be seen in rare circumstances. If they want to do that, it's the wrong way around. It should open towards the river, which would put the logo upside down, like it was on PowerBooks, and I think early MacBooks. Will make their building really easy to find on a satellite view of the area in Maps.